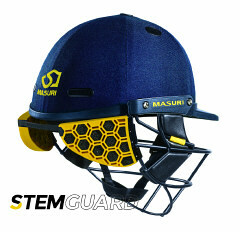 The helmet is not included, this is a StemGuard only and fits Masuri Senior Elite and Test Helmets only. It attatches to existing Masuri Vision Series Elite and Test helmets with moulded clips included in the pack. The attachment has been designed to give batsman free movement, while offering protection to the vulnerable region at the back of the head and neck. This new innovation by Masuri combines an impact modified TPU honeycomb with military grade crush foam in order to maximise impact absorption, giving players much more confidence when batting. Available in core helmet colours, plus yellow, please select from the drop down list. Fits Senior and Junior Masuri Elite and Test cricket helmets.